Daily Resort Charge will be added to the room rate and includes Guest internet access/ DVD NOW with unlimited movies 2 16 oz. bottles of water per day 10PCT off spa retail and treatments self parking 1-800/local calls. Hilton Grand Vacations Suites on the Las Vegas Strip is located at the north end of Las Vegas Strip and offers studios and one and two-bedroom suites. The resort is a short distance from the Las Vegas Convention Center and convenient to the I-15 Freeway. Five miles from McCarran International Airport Las Vegas Executive Air Terminal and Signature Flight Support. All the conveniences of home in spacious studios and one- two- and three-bedroom suites. 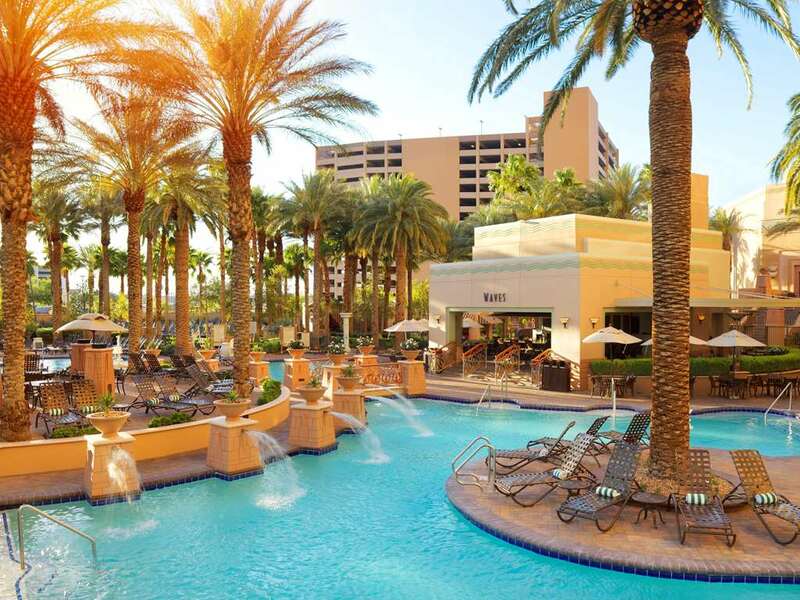 Also at Hilton Grand Vacations Suites on the Las Vegas Strip is our spa eforea. The Spa offers treatment rooms a luxurious relaxation lounge and steam rooms along with an extensive treatment menu including aromatic facials therapeutic massages pampering manicures pedicures and restorative body treatments. Hilton Grand Vacations Suites on the Las Vegas Strip Amenities and Services *Luxurious non-gaming elegant resort hotel *Heated outdoor swimming pool and whirlpool spa with private cabanas available *Outdoor poolside gas grills with plenty of patio dining areas *On-site Marketplace deli restaurant seasonal pool bar - grill and gift shop *Complimentary Fitness Center featuring Precor equipment *Business Center with complimentary printing *Full service Concierge for show tickets dining reservations and local tours *Across the street from a Las Vegas monorail station providing easy access to the Strip and Convention Center Daily Resort Charge will be added to the room rate and includes Guest internet access. DVD NOW with unlimited movies. 2 16 oz. bottles of water per day. 10 off spa retail and treatments. self parking. 1-800/local calls. Waves Pool Bar and Grill: Casual Outdoor Pool Bar - Grill. Open Seasonally April - October Weather Permitting. Food Service until 8 p.m. Bar Service until 10 p.m.